Calisphere: Annotations on Musick's delight on the cithren. UCLA, William Andrews Clark Memorial Library > Early Modern Annotated Books from UCLA’s Clark Library > Annotations on Musick's delight on the cithren. Text set / Annotations on Musick's delight on the cithren. RE: Calisphere: Request high-resolution copy of item for Annotations on Musick's delight on the cithren. Do you need a bigger file? The file available on this site is 1024 x 667 px. To obtain an alternate file type or higher resolution copy, please contact the owning institution. Annotations on Musick's delight on the cithren. Musick's delight on the cithren. London: Printed by W[illiam] G[odbid], and sold by J. Playford at his shop in the Temple, 1666. Scope/Content: Manuscript annotations in printed book. Scope/Content: Manuscript annotations by W. Rock in his copy of Playford's Musick's delight on the cithren. Annotations consist of Rock's rendering of the original printed tablature into musical notation, in pencil. Condition: Mottled calf, stamped in gilt. Cittern--Instruction and study--Early works to 1800. 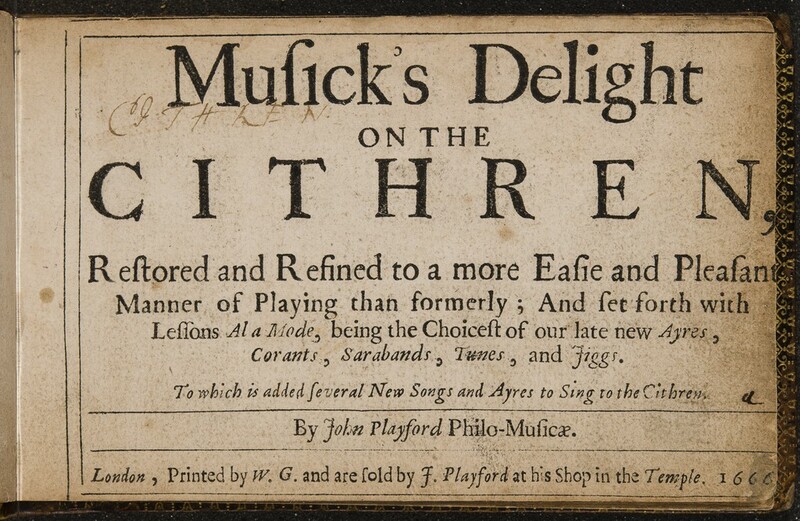 Playford, John, 1623-1686?--Musick's delight on the cithren.--1666. W. Rock inscribed in pencil on first preliminary page.